This mosaic began from the single tesserae of Venetian gold mosaic smalti given to the artist by the owner of the great Angelo Orsoni mosaic works in Venice. Gary knew that he want to use the piece in a mosaic but he wanted it to be unique in that work, gold smalti usually appear in large quantities in the fields of gold in the great Byzantine style church mosaics of Europe. 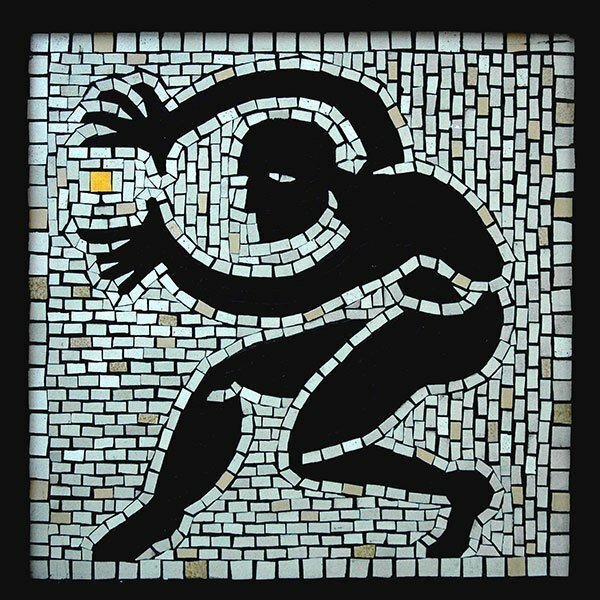 Gary decided to make the work about the act of creation and contemplation of making a mosaic, and too about the inhibition of attempting to work with a precious piece. The artist made the rest of the work in simple black and white ceramic, the white background radiating out from the gold tesserae white the black silhouetted figure of the artist both covets and shys away from the gold.